Happy Holidays from Blackwater Rollers! We have lots of news to share! We were extremely thankful for the great weather for the December 4th Lynchburg Christmas Parade! Special thanks to our Derby Dad and Mom for finding (and pimping out) our ride…..with lights and everything! It was so much fun to skate through downtown, hear the cheers, hug as many folks as possible and share holiday greetings. Apologies that we ran out of flyers….here is the schedule for 2013 that we want everyone to know about! 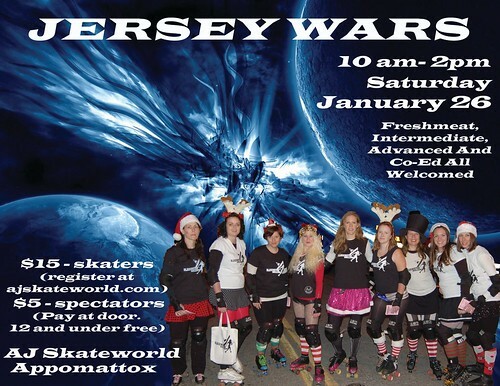 One exciting event we are have been looking forward to for a long time is AJ Skateworld Grand Reopening! Help celebrate the Ribbon Cutting Ceremony on January 4th at 1:00 pm, then come back to skate from 7 – 10pm that evening! Check out their website, AJSkateworld.com, for the latest information about birthday parties, open skate sessions, and even Zumba classes! 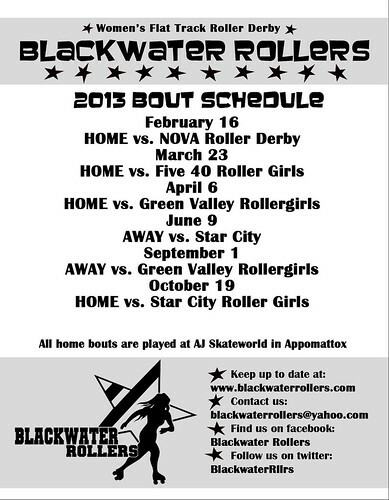 Blackwater Rollers have reduced program advertising rates for our sponsors. We would love to partner with your business to support local folks, or publish a special message for you. We are also accepting sponsors forindividual skaters. Unfortunately, insurance costs have risen by 37% this year and it is mandatory that we have this coverage. Our skaters purchase all their own equipment and pay club dues monthly, so this added costis quite a burden. Please consider helping your favorite skater continue to give her all on the track by becoming her sponsor! Your business or chosen name (such as “secret derby admirer”) will receive recognition and appreciation in our program throughout the season. Contact us at blackwaterrollers@yahoo.com for more information and rates! Stay tuned for information about a special event/pre-season scrimmage coming up January 26th! Until then….hope to see you on the Percival’s Island trail, at open skate sessions….or on the track!! !